(August 28, London, Sri Lanka Guardian) The news in the Channel 4 alleging war crimes committed by the Sri Lankan soldiers have raised barrage of questions about the confrontational attitude of the Sri Lankan government to counter the news. The first source to counter the news was the Sri Lankan High Commission in London. It told the Channel 4 News: "The High Commission has noted that in many instances in the past, various media institutions used doctored videos, photographs and documents to defame the Sri Lankan Government and armed forces. "Therefore, we request you to verify the authenticity of the video footage." This very comment invited me to respond to the Sri Lanka High Commissioner in London in this write-up. 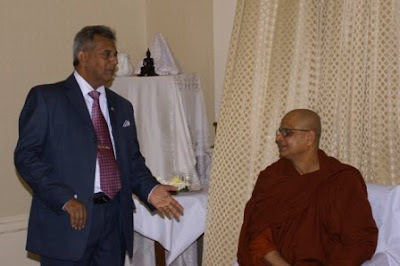 Sri Lanka High Commissioner Justice Nihal Jayasinghe with a Buddhist prelate. A person of such high legal standing, including sitting in the Sri Lanka’s highest Supreme Court and serving in the War Crimes Tribunal in The Hague, his (as head of the High Commission) judgement to counter the news with frolicsome comment that it is doctored footage invites anyone to question his compromising status to hold a position as High Commissioner. Such revelations need high degree of investigations and must go into minute details before someone like Nihal- a retired judge, could pass judgement at a stroke. Without verifying the details with legal acumen and applying high degree of burden of proof, the retired Justice Nihal Jayasinghe had taken the political path of his masters to compromise his standing as a judge (until his retirement). Having obstructed all the paths for any judicious inquiry into war crimes, foul crying that it is a doctored footage is an insult to the judicial service that he has represented for over many years. By simply denouncing the footage as bogus, will not exonerate Sri Lanka of not committing war crimes. The TV news footage showed the gruesome nature of the killings and this was not the first time the army had allegedly committed a crime. Since mid 1970’s, in the name of countering terrorism, heinous crimes have been committed against Tamil combatants and the innocent civilian population by the government forces. War Crimes were practiced as systematic tools to suppress the Tamil violence and Tamil aspirations for over thirty years. The hate mindset of the army can be graphically illustrated when the naked bodies of the dead LTTE cadres were paraded through the holy city of Anuradhapura in 2008. Despite the President ordering an investigation to subdue the outcry, the outcome of the inquiry is still not known. Sources say, the investigation was never undertaken. The Sri Lankan High Commissioner Nihal Jayasinghe has come under considerable criticism from the cross section of the Sri Lankan community in the United Kingdom. His engagement with the Sri Lankan’s are said to be limited to involvement with the extremist Sinhalese. Since his appointment, he has disengaged all the structures and approaches to have wider engagement with all the Sri Lankan communities in the UK. There are concerns about his insensitive attitude and comments about the minorities in Sri Lanka. He blatantly espouse that the minorities were never discriminated in Sri Lanka and that they enjoy all the privileges like the majority community. He takes the stance that empowerment of minorities is not needed and by handpicking Tamil officials in the government service, he states Tamils are fully empowered in Sri Lanka. When I discussed my concerns about the High Commissioner with a respectable official in the Sri Lanka High Commission (A Sinhalese) he said: ‘Let me tell you Mr Jayadevan, the High Commissioner is a racist. Don’t waste your time with him ’. If you expect bogus lies that have been propagated by the so called diaspora that is an expectation too far. Majority of the diaspora who shout so much about discrimination are people who have got the best out of the free education in SL.I am yet to hear any tamil professional in the UK or else where who has the courage to say what benefits they have accrued from the system. The only thing they propagate is discrimination.The truth was once spoken by a tamil expatriate who said he did not know what discrimination was until he arrived in the UK. That is the reality. Who is this sudda fellow blind folded? Channel 4 propaganda networks have gone to town to create this news item with doctored images. LTTE is still using their famous line to describe Sri Lankan Forces are tortures, murders and rapists. This may be applying to Tiger cadres who have over the 30 years inflicted pain on Tamil People. It is a fact with such a vast network of resources they can tap any journalist anywhere in the world and get them to write anything they want. Time to time various foreign nationals who write about Sri Lanka has no clue about Sri Lanka. They are just paid servants. The recent law Britain was trying to introduce to apply same sanity to the web as the printed media did not go well. This is a classic example for this behavior. People on the web and other news media should be held severely accountable for whatever they publish. While journalistic freedom is valued, it does not be seen as media has a gospel right to tell lies with immunity. Look at the incident of SSP Laxman Cooray while being a senior Police Officer what a damage he has done to Sri Lanka. He has been showered with luxuries gifts and money by the LTTE to carry out such a wave of violence on innocent people. This is not a secret when you look back 30 years of conflict, who prospered at the expense of average citizen. There are police officers who had retired still of government pension who has collected lots of money from the LTTE. Perhaps it is the time we look back at politicians, members of the judiciary, Armed Services and Police how they generated this exorbitant wealth in a short time. Perhaps we must investigate any citizen who had made money like that in the past years just for cleaning the record. Just because he served as a Legal expert on the bench for so many years he knows how these things work, he did not get old for nothing. He is a good HC and works very hard, it is a difficult period for everyone. He is doing a fabulous job here representing us and our children within all the communities, local, national and regional. LTTE sympathisers trying to pick up all sorts of trouble with him and he would not tolerate nonsense. He knows his job and he will deal with things differently. He is not a racist and I think it is very important to see how many Tamils, English and other nations invites him for celebrations of their work and grt speeches, in fact lectures he delivered emphasising what is it take to be or got to be untied Sri Lanka. He trusts that our nations should teach and allow the opportunity to our children to have most of our values, languages and cultures, which is his job. It is very unfair that to judge him over the very difficult period. We are very proud of our HC and pls refrain for personal attack as it is very important to discuss things in details, rather than talking about few isolated stories. I have met him on several occasions on several different functions, not only SL, but other countries celebrations. He tries hard to reach out and meet as many people as he can on top of so many important businessman, commercial, political and upheaval. He used his discretions to allow UK FCO FS, Des Brown to visit SL, with many people objecting the idea. I think he is a very much mature person with out look of life of Sri Lankan in UK.